I may not have been with Atkins long, but I know I made the right choice to start my career here. 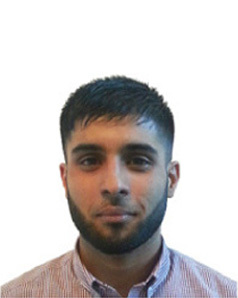 I joined in August 2013 as an apprentice technician in the Birmingham office. Before that I had just completed my A-levels in maths, chemistry and biology. Trying to find your feet after A-levels these days is daunting; at first I didn’t know what path to choose – whether to go to university or to jump headfirst into a job. Then someone recommended that I consider apprenticeships, so I began to research the National Apprentice Scheme and found out about Atkins. My apprenticeship scheme is for two years and I’m currently in the transportation drainage team within Land & Development. From day one it’s been hands-on; I’ve had a steady flow of both admin and project-based work on a range of projects, including East-West Rail, Cadley Hill and Wadi Al Buhair in Bahrain – all in just one month! It’s exciting to be working on real-life projects and learning in such a dynamic environment. I’ve been mentored from my very first day by a colleague who’s done all he can to make sure I learn the ropes. With more new tasks to get stuck into every day, it’s been so reassuring to have someone on hand to offer advice, take me through the technical systems and help me build my skills base. My line manager has also set out year-one objectives with me so I have clear targets to strive for. The hands-on nature of my apprenticeship is really stimulating, giving me the chance to apply my existing knowledge and learn on the job. I’m particularly enjoying developing my AutoCAD design skills on live projects. But I’m also able to support this with technical studies – I’m currently working four days a week and spending one day a week studying Level 3 Civil Engineering at Solihull College. It’s the best of both worlds and has allowed me to achieve more than I’d ever expected at the age of 19. Having been so torn between academic studies and the world of work, I’m really grateful to have had the opportunity to combine the two. It’s a great experience – I couldn’t have made a better choice. MBDA Apprentice Samantha Ball took to the stage during October’s Conservative Party conference to discuss her experience of a being a logistics apprentice at the defence company and to promote apprenticeships as a viable alternative to full-time education. 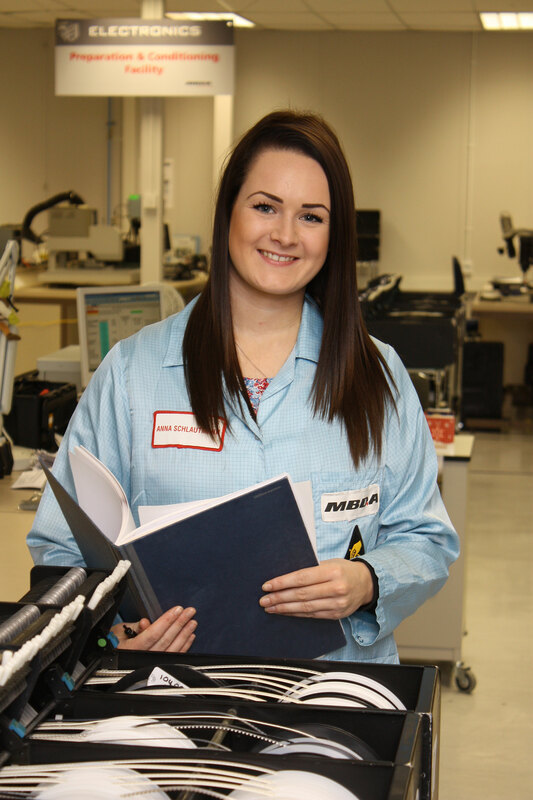 Samantha is currently in her final year of a four year MBDA apprenticeship and has worked across various departments of the company on rotating placements. She said: “My apprenticeship has offered me many opportunities that I wouldn’t otherwise have had. Being an apprentice and earning means I can have a good social life, run a car and save for a house deposit all at the age of 21. “I am so appreciative of the opportunities and lifestyle that earning and learning has given me. My experience highlights the naivety around apprenticeships. It is so important that young people are made aware of all of the different options”. Follow our YouTube channel to view all the latest from The 5% Club. 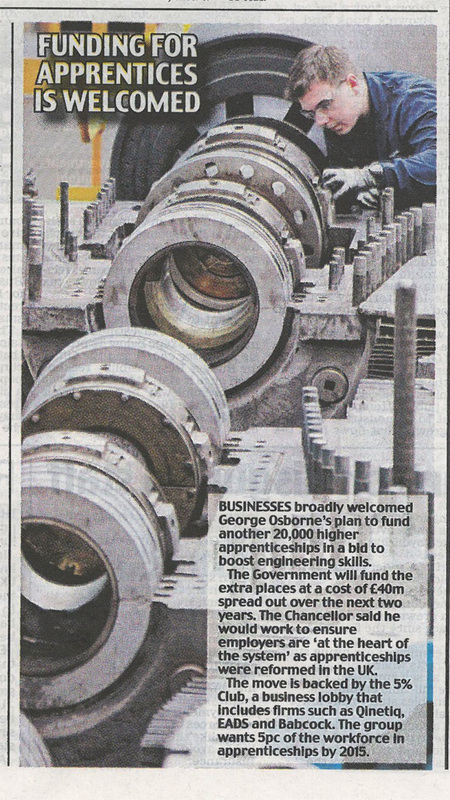 Yesterday’s Autumn Statement is the primary talking point of the week, with the announcement by Chancellor George Osborne that apprenticeships are to be given a £40m boost with the aim of producing a further 20,000 higher apprentices over the next two years. 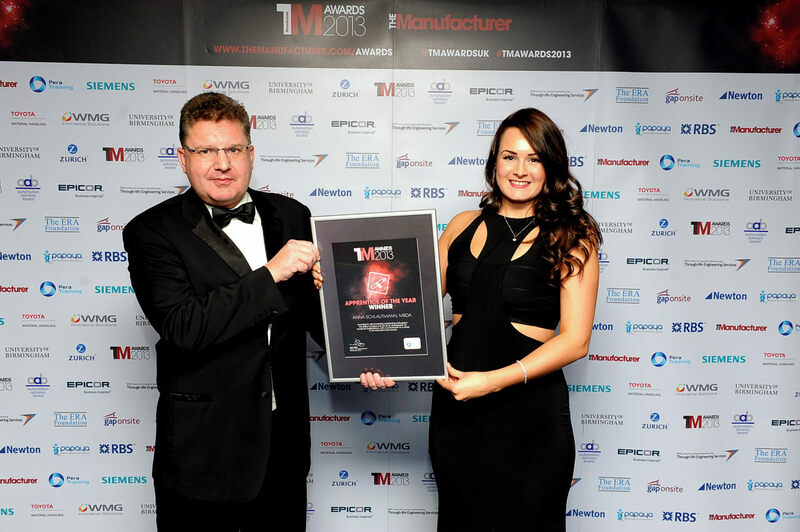 Away from the Autumn Statement and moving on to more success stories from our members, QinetiQ’s Lauren Hill was named Most Inspirational Apprentice at the Stemnet Awards 2013 last week. Lauren, an apprentice at the QinetiQ Apprentice Training School at MOD Boscombe Down, was rewarded for ‘her commitment, enthusiasm, dedication and natural ability to communicate her excitement about working as an apprentice’. As part of her win, Lauren has received a trip to CERN in Geneva – home of the Large Hadron Collider – provided by the Science and Technology Facilities Council (STFC). To cap off another eventful week at The 5% Club, we are delighted to welcome the latest company to sign the Club charter- Seaway Powell Marine, a leading figure from within the marine industry. In the latest in the series of The 5% Club case studies, we take a look at Tom Wheatley, a third year QinetiQ aeronautical apprentice at MOD Boscombe Down. Find out more about Tom’s daily role, plus his thoughts on The 5% Club. Before I embarked on my apprenticeship at QinetiQ, I did A-Levels with the aim of being a landscape designer. I decided to take time out of education and worked for a year but realised gardening wasn’t for me. After looking at various options, what I knew I didn’t want to do was to go to university. I learn practically and, although Uni is right for some careers, apprenticeships are great for practical learners like me. So the path that I decided to go down was to train as an apprentice with a view to entering the engineering industry, developing valuable skills whilst learning ‘on the job’. Despite strong competition, I was fortunate enough to enrol at the QinetiQ Apprentice Training School at MOD Boscombe Down, and I can safely say that I haven’t looked back since. My dad was a one-time apprentice and his experiences helped me to understand what an apprenticeship entailed and the opportunities that it could hand me. 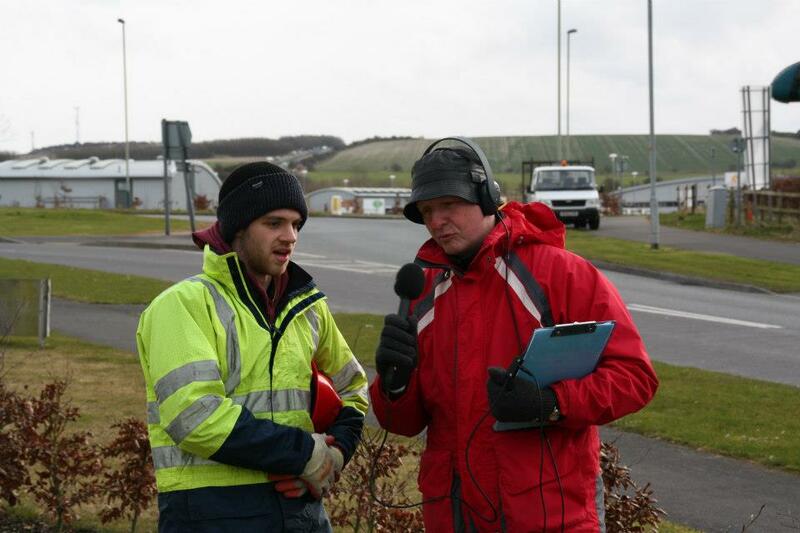 What I really like about the QinetiQ apprenticeship scheme is the sheer versatility of the programme. Upon enrolling, my initial ambition was to train to become an aircraft engineer. However, the breadth of learning here and the proximity you have to different areas of the company has meant that my career path has changed. At QinetiQ, you can really carve out your own career without being pigeonholed, whilst still developing a wide set of skills that are transferrable. The company allows you to target your own goals, and they provide you with all the support and rewards you need. Another aspect of the apprenticeship that I have really benefited from is the opportunity to work within the company itself, amongst experienced QinetiQ staff. Working alongside my future colleagues has enabled me to earn their respect and it represents a great practical experience too. Throughout my apprenticeship at QinetiQ, I have worked in a calm and unpressurised environment that has allowed me to refine and develop various skills, ready for real-world situations. There is a newly refurbished aircraft hangar at MOD Boscombe Down which now forms part of the QinetiQ Apprentice Training School, and will be a hugely important aspect of our practical education. The hangar now gives students much more space and provides us with the right equipment to develop skills, including de-commissioned aircraft that will be used for practical lessons. There are two rotary-aircraft within the hangar: a Lynx and a Gazelle helicopter, as well as a fixed-wing Bulldog aircraft, aircraft engines and components. My fellow apprentices and myself are going to gain vast experience working on these and by learning ‘live’ in this environment, we are getting a head start on others who enter the industry as undergraduates. The 5% Club is a very positive and important initiative. Apprenticeships are a rather unknown entity amongst school leavers and that is something that I feel must change. Young people are often presented with just two choices when leaving school; start working with no training, or go to university. Apprenticeships have until recently been seen as an unattractive ‘other’ route, and aren’t fully understood by school leavers. From my own experience, apprenticeships are a comparable option to University and a fantastic way to get into the work place. They can increase chances of employment, whilst also being paid at the same time – that is something that a university course cannot compete with. If the 5% Club can increase awareness of apprenticeships schemes as well as inspire other companies to provide further opportunities for those who wish to get their foot on the careers ladder, then it could have a massive impact on my generation.